In early Asian trade, the Swiss franc dropped sharply versus major rivals. The U.S. dollar USDCHF, +0.5508% jumped as high as 1.0095 francs, its highest since November, before falling back to a session low of 0.9991 less than an hour later, according to Dow Jones Market Data. The dollar fetched 1.0039 francs in recent action, up 0.4% on the day. 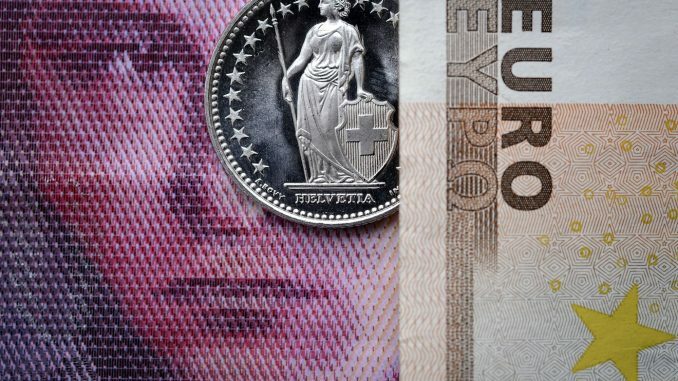 The euro/Swiss pair EURCHF, +0.0442% also saw a roughly 1% swing, with the shared currency jumping as high as 1.14205 francs before dropping back to a session low of 1.13115. The euro was recently off 0.1% at 1.1325 francs. The British pound-franc GBPCHF, -0.2395% and franc-Japanese yen CHFJPY, +0.26% pairs, saw similar trading action.